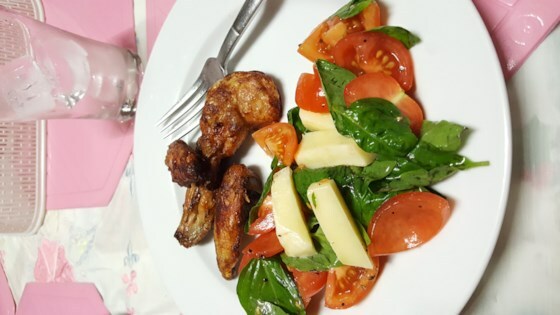 "Chicken wings baked with a mixture of hot sauce, tomato sauce, chili powder and cayenne. A nice spicy bite! Vary the seasonings to your liking." Bake wings in preheated oven for 30 minutes, or until cooked through and crispy. Meanwhile, in a small bowl combine melted butter, red pepper sauce, tomato sauce, chili powder and cayenne pepper. Mix together. When wings are baked, dip in sauce to coat well, then shake off excess and return coated wings to baking sheet. Reduce oven temperature to 250 degrees F (120 degrees C) and bake for another 15 minutes to set sauce. Like to have your house smell like greasy chicken? How about your cloths? And, it really does a number on the inside of your oven! Don't bother, order out. These are SOOOOOOOOOOOOOOO good! I could live eating just Buffalo Wings. I added some honey, worchestershire sauce and chili sauce to the mixture to give it a sweet and spicy taste. I thought these were great. I did bake at 400 for 45 minutes, then at 250 for about 10 minutes after adding sauce. To make sure they were crispy I broiled them for the last 5 minutes.